Census Districts (CD), 1871 Census of Canada , and were derived from a combination of sources including the Atlas of Canada 1:7 500 000 data set. Note: There is a second version of the 1871 census districts available in the GeoPortal, under the same title. These datasets have different publishers/producers and spatial references. This data set reconstructs the census compilation and dissemination geography of the 1871 Census of the Canadas, including the census districts (CD) of Ontario, Quebec, New Brunswick, and Nova Scotia. The boundaries were originally compiled for the Historical Atlas of Canada Online Learning Project, and were derived from a combination of sources including the Atlas of Canada 1:7 500 000 data set. This data set was created by the Historical Atlas of Canada project, and depicts census district boundaries that reconstruct the census compilation and dissemination geography of the 1871 Census of the Canadas. It can be used for mapping and reference purposes at smaller scales (large territory coverage). The Historical Atlas of Canada was a three-volume collaborative research and publishing project, completed in 1993, which used maps, text, and other graphics, to explore themes in the history of Canada. The Historical Atlas of Canada was published in English and French, the last volume in 1993. In 1998, the Concise Historical Atlas of Canada was published, with a selection of plates from the original volumes, and new essays connecting them. The Atlas uses thematic mapping to describe events, issues or patterns in Canada's development. The Historical Atlas of Canada Online Learning Project converted and reworked the GIS data and intends to make the maps and data generated for the Atlas available to a wider audience by re-designing them for the Internet. The Historical Atlas of Canada Online Learning Project owes its existence to the researchers, authors, editors, editorial boards, and publishers of the original Historical Atlas of Canada, and its funding agencies. These included federal government research agencies, provincial ministries and some private donors. 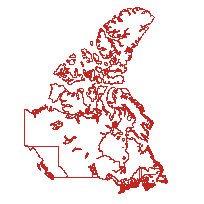 Census districts and divisions are based on original GIS base layers from the National Atlas of Canada 1:7,500,000 data set. Original GIS base layers are available through GeoGratis (http://geogratis.ca/). Sources: Historical Atlas of Canada, Historical Atlas of Canada Online Learning Project, Historical Atlas of Canada Data Dissemination Project. For more information please read the Authors and Sources Note, available from the 'Additional Documentation' section.